For reasons obvious to any cyclist, we must improve the forward conspicuity of our Tour Easy recumbents with a white daytime running light; a near-miss boosted this to the front of the project queue. While you can outfit a standard bike with a handlebar-mounted headlight (*), at any price from the sublime to the ridiculous, the smooth snout of a fully faired recumbent covers all the usual attachment points. 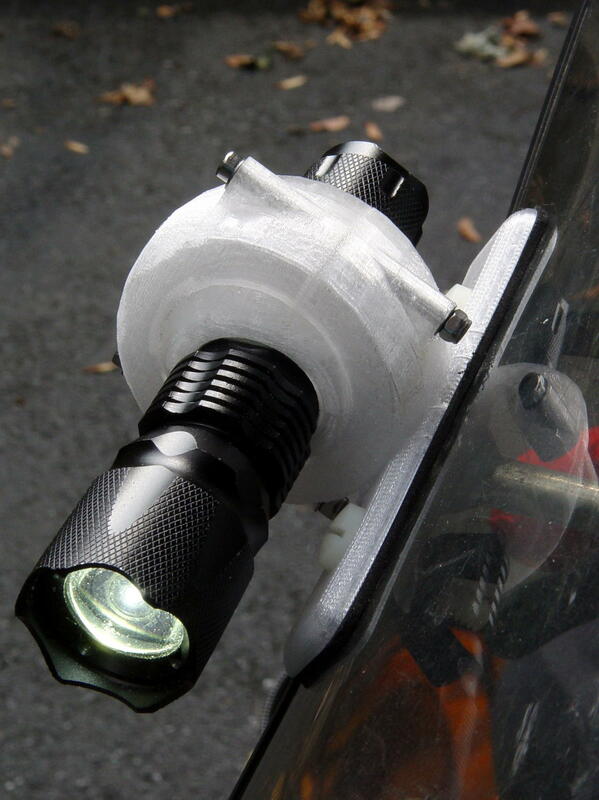 That’s a J5 Tactical V2 flashlight on my bike. The Anker required an adapter to hold an 18650 cell in its 3xAAA-size body. The J5 V2 is resolutely 18650-only, which is fine with me. The intent here is to find out whether this works, figure out the proper aiming point(s), then de-bulk the mount. The next few posts will cover various bits & pieces of the design, because I must remember why I did things the way they turned out: sometimes the obvious choices didn’t work. The tapered edges were supposed to be flexible, but the foam sheets sandwiched on both sides of the fairing actually provided most of the compliance. 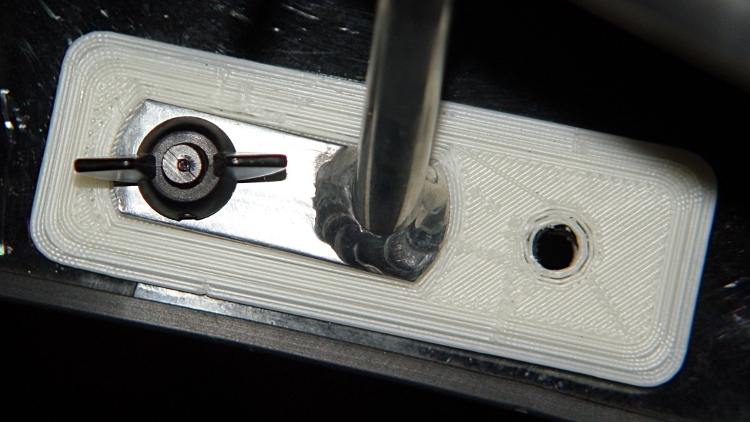 There’s another screw in the open hole binding the inner & outer plates together. The mounts worked perfectly, even as they faded over the years. The fairings became quite scuffed during the course of our near-daily rides, but, heck, we’re also a bit scuffed and it’s still all good. 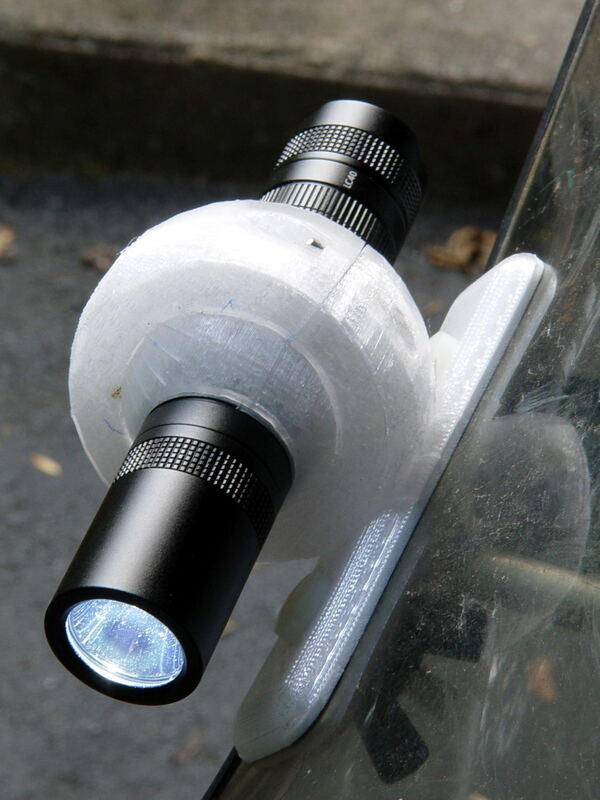 The flashlight on the outer plate applies torque around the bolt which (I hope) the sides of the recess can resist. This is the absolutely key part of the design and, I’m somewhat ashamed to admit, took me far too long to figure out. 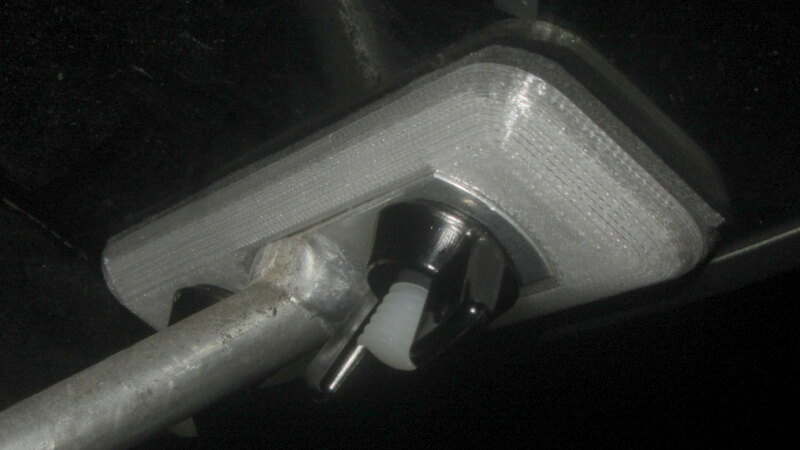 What you don’t want: weird & fragile gimcrackery clamped onto the strut extending under the fairing’s edge, with the flashlight hanging far off to the side. 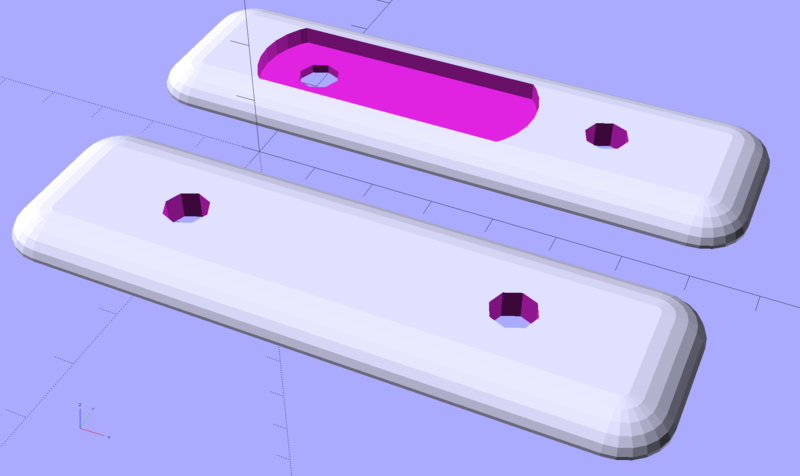 The hole isn’t strictly necessary, as I punch out both screw holes as part of the plate assemblies. You could replace the squared-off ends with simple half-circles, maybe stretched into stylin’ ellipse shapes, without too much effort. 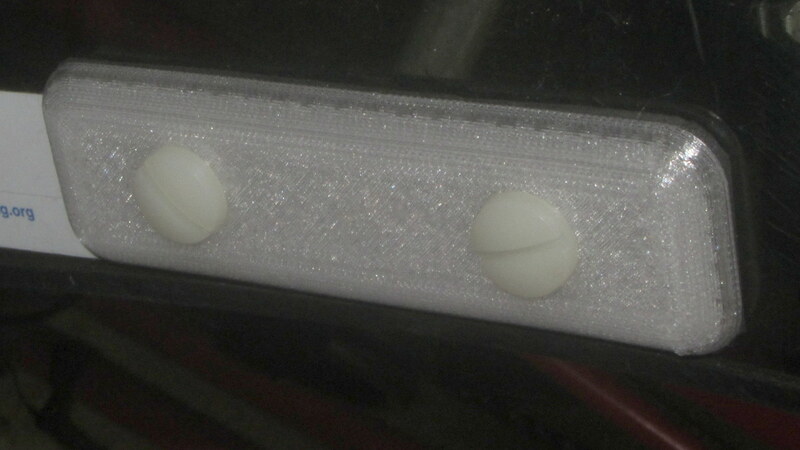 I got out the screws, set up to cut them with a pull saw and miter box, then realized they are plastic. Put away the saw, got out the utility knife, and cut them to length with one firm push. No distorted threads, no dust, no muss, no fuss. (*) Opinion: any headlight with non-replaceable, USB-chargeable cells is a toy. I can replace a discharged (or failed) 18650 cell in the middle of a ride, where a dead battery inside a spendy headlight would leave me in the dark. Might not matter for a DRL, but seems absolutely critical on night rides. ‘Nuff said. This entry was posted on 2017-07-19, 07:53 and is filed under Machine Shop, Recumbent Bicycling. You can follow any responses to this entry through RSS 2.0. Both comments and pings are currently closed.